The First Baptist Church was organized at New Stonewall, Indian Territory in 1903. The original building was built on the same site as today. A $100 mortgage was made to the American Baptist Home Mission Society a few months before Indian Territory became a state. The building was mortgaged in order to pay for seating and windows. Additions to the original building were made on the north side in 1918-1920. In April 1952, I.P. Willingham, Chairman of the Deacons, held the old mortgage while Mrs. J.E. Carroll, the only living charter member at the time, struck the match to burn the document, celebrating the payoff! The first parsonage was built on the north side of the property. This building was used until 1953 when it was torn down and the present Sanctuary was constructed and dedicated January 10, 1954. 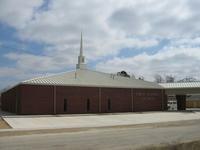 The new building included the auditorium, classroom, pastor's study and restrooms. Construction was overseen by Mr. Charlie Riley with much of the labor donated by men of the community. Mr. Vernon Younts drew the plans for the building. Brother Holt Sodeman was pastor of the church at this time. In 1958 additional classrooms and the church office were added under Mack Caffey's leadership. Central heat and air conditioning were added as well in 1969. The current parsonage was built across the street in 1969 during David Fry's pastorate. In May 1973, while Rodney Dowdy was pastor, the church purchased the property adjacent to the east side of the church. The house on this land was converted into a pre-school building known as the "Happy House." Later in Brother Dowdy's pastorate, a desire to meet the needs of a growing church resulted in addition of another wing. The Fellowship Hall, Nursery facilities and additional classrooms were completed in 1978. In the early 1980's a vision was shared by the church family for three future building ventures. The first, the Youth Education wing was added in 1986 during the pastorate of Richard Dickerson. Second, a new Falls Creek cabin was completed in 1992 with Gary Jamar as pastor. Both of these structures were accomplished with a great deal of labor by church members and others of the community. We have been blessed to have both planners and specialists in various facets of building among our willing servants. On September 21, 2003, a ground breaking ceremony was held for the third and final phase of the three building ventures - the new Worship Center. The well designed and beautifully constructed building was completed and dedicated in October of 2006. The Worship Center is equipped with state-of-the-art audio and visual equipment, additional classroom space and will comfortably facilitate future growth of the church body.